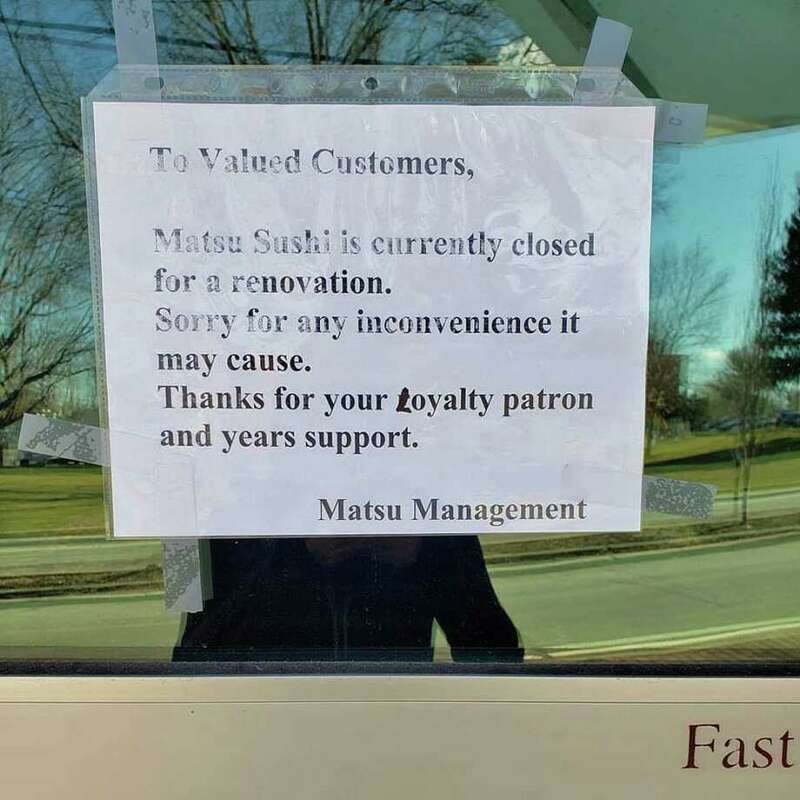 A sign in front of Matsu Sushi on April 1, 2019, says the restaurant is closed for renovations. WESTPORT — A local sushi shop charged with several labor abuses over the past year appeared to close suddenly on Monday. “Matsu Sushi is currently closed for renovation,” a sign posted on the door of the restaurant Monday stated. Matsu, a mainstay of downtown Westport for 17 years, thanked its loyal patrons for years of support in the sign. The night before, frequent Matsu customer Molly Alger wrote to the local blog 06880 to say she had dinner at Matsu on Sunday night and learned it was the restaurant’s last day in business. “They tried to give us serving dishes and other things as well. I am so sorry to see this great restaurant close,” Alger wrote. Matsu’s owners did not respond to call for comment. The dark cloud of labor violations at Matsu is related to its supposed closure, Sarah Ahn, an organizer with the Flushing Workers Center said. “I see it as their attempt to wash their hands and not pay back what they owe these workers and try to wait them out or avoid responsibility,” Ahn said. Ahn first became aware of the labor violations at Matsu when Liguo Ding and Jianming Jing, two former Matsu employees came to the Workers Center in December of 2017. Jiang and Ding, both residents of Queens, N.Y., were fired from Matsu Sushi in December 2017 after the restaurant’s owners — Ziqiao Cao and Kim Ming Cheng — terminated them for refusing to complete a 36-hour shift. With the help of the Workers Centers and James Bhandary-Alexander, an attorney with New Haven Legal Assistance Association, Inc., Jiang and Ding filed a complaint with the National Labor Relations Board against Matsu. Jiang and Ding also filed a lawsuit against the restaurant along with two of their former Matsu co-workers for failure to pay minimum and overtime wages. In an Oct. 26 decision labor board Judge Kenneth W. Chu said Matsu’s owners discriminatory fired Ding and Jiang and ordered the owners to immediately reinstate the two workers, which as of April 1, Matsu had not. In June, Judge Stefan R. Underhill, a U.S. district judge for Connecticut, announced Matsu cannot sell the restaurant until it pays former workers for the unpaid minimum and overtime wages. “It’s commonly believed that you can escape from liability in this type of case but that’s not true,” Bhandary-Alexander said. He noted Matsu’s owners, the defendants in the case, could still be held liable if found guilty in district court because of Underhill’s decision and a $250,000 lien against the restaurant. “We’re going back to the courts to try to resolve some of this. We’re definitely not throwing in the towel or letting them just do whatever they would like to. The fight is far from over,” Ahn said.